Tribunal day was 18th January 2013. Fast forward 4 years after losing it but Dylan and his progress is still going strong. We maintain Dylans statement of SEN as a warped safety net for if Dad and I are no longer able to continue ABA or home ed. There is no way Dylan would go back to a local school without me being very, very involved throughout. It is my experience the SEN education system is full of uncaring penny pinching fools. After attending tribunal to appeal the lack of support for Dylan being at home back in 2013 we waited 7-10 days to receive the news that we had lost and that the local school we had removed him from was deemed suitable, regardless of how far Dylan had progressed since leaving it. To lose after all that hard work of appealing was gutting to say the least, however we were aware that even if we had won we had an annual review booked in the following Feb. The education authority could have taken any provision gained at tribunal away, only 5 weeks after us winning it. The system is so messed up that they would have been well within their rights to do so and we would have had to endure the whole 12 month tribunal experience and expense to claw it back. A heartbreaking situation. Thankfully we decided to cut our losses and apply all of our focus where it mattered. On Dylan. That was 4 years ago and I still feel a huge sense of injustice at the warped system of SEN assessment and provision. No other public funded service governes itself and has no one to answer to like the SEN system does. The reckless decision making and inadequate assessments are not permitted without justification – not in the NHS, not social care, not even regular education is run this way. But SEN teams make their own rules. They play their own merry tune and as a mere parent you have to dance to it. SEN teams can make life changing decisions about children and situations that they have never encountered and there is no one to question these decisions that have been made. Unless you go to tribunal. So £6000 later and potentially nothing gained. We had it confirmed; the system stinks, it’s corrupt and preys on the vulnerable. 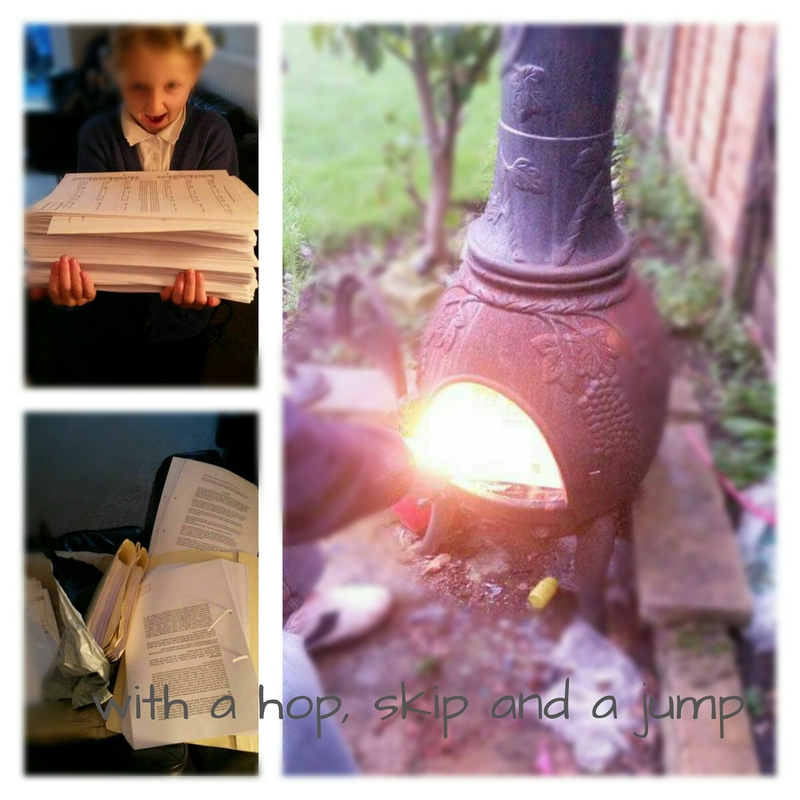 We burnt every last report, document and assessment. It was like therapy! However since then I have happily reduced interaction with the education authorities as much as possible but the looming EHCP will not allow me such pleasure. The whole assessment process involves Dylan’s education being cut back to the bone and every little bit of progress and success being played down in an effort to confirm Dylans difficulties so that he can receive maybe part of any help that he needs. The prospect of selling my dear boy out to ensure the provision he needs is potentially safeguarded fills me with hate. Hate for the negative reports. Hate for the judgements. Hate for the whole system. It’s going to be a long couple of months. Oh this brought tears to my eyes. I worked for most of a lifetime in mainstream and SEN in the UK state system as a teacher – battling with the ‘experts’ and inspectors and purse-string-holders to get the provision ‘my’ kids needed and to support their families. Anyhow, wishing you all the best with the hoops you have to jump through over the coming months. I fully understand that awful feeling of having to emphasise all the negatives and play down the wonders, just to get the authorities to play ball. Glad Dylan’s got you. You sound amazing parents. Hi Jan, lovely comments thanks for reading.